Calgary Folk Music Festival – This festival in Canada makes an effort to be more sustainable by eliminating the sale of disposable water bottles, using compostable cutlery and dishes, and encouraging cycling to and from the festival. There is also an Environment Crew of volunteers that work to reduce the contamination rate of waste by sorting all types of waste, and also overseeing the waste stations. Volunteers even pick up hundreds of cigarette butts every day to try to ensure they do not end up washing into the river. One of the newest initiatives at the Calgary Folk Music Festival is a Greenest Vendor award, which encourages vendors to adopt environmentally friendly behaviour. 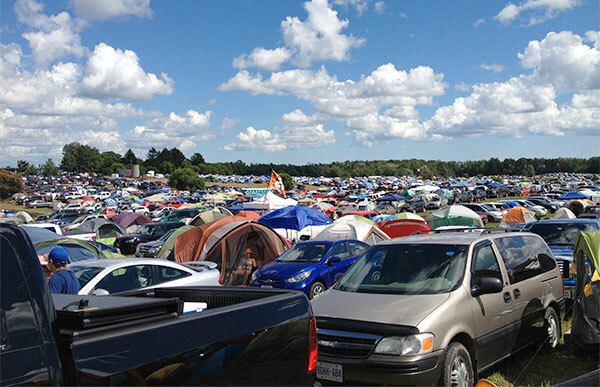 Hillside Festival – This festival in Ontario, Canada has eliminated disposable, single use dishes and cutlery from their festival. All plates, cups and cutlery used during the festival are washed by a volunteer crew, and are continued to be re-used. Beer tents sell reusable beer mugs, and reusable sporks are available for sale throughout the festival grounds as well. In addition to the impressive dishwashing initiative, there is a free water tank, a solar-powered stage, and a green roof on the main state. Glastonbury Festival –This festival in the UK supports causes to try to keep the festival’s impact ‘cleaner, greener and fairer’. Donations are made every year to organizations such as Greenpeace, and these organizations are invited to the festival to spread their message. Also, in the past 15 years over 10,000 native trees and plants have been planted on the festival grounds. In addition to that Glastonbury Festival uses solar panels, hybrid generators, a thorough recycling program, and many fair trade products. Splore – This festival in New Zealand provides festival goers with an abundance of options to reduce their impact on the environment at the festival. One initiative is the Globelet, which is a reusable cup purchased when an attendee buys their first drink at the bar. These cups can then be used again and again throughout the festival at all bars. In the past this has helped to reduce over 50,000 single use cups from going to the landfill. An environmental group even set up a mobile washing station to help keep the cups clean and in use. Splore has a detailed Sustainability Policy that assists in continuing to improve the sustainability benchmark of the festival every year with new initiatives. Mariposa Folk Festival – This festival in Ontario, Canada has gone above and beyond other festivals. Not only eliminating water bottles which has saved thousands of bottles and cups from landfill, the festival also offers bike parking and a shuttle bus to reduce carbon emissions. All food vendors use compostable plates and cutlery and the festival works with local suppliers whenever possible. This festival has diverted over 70% of waste from landfill. Bonnaroo Music Festival – This music festival in the USA promotes carpooling so much that if you carpool with four or more people in your car you are eligible for special prizes. The festival also gives $1 from every ticket to help support site improvements on the farm it is hosted. The festival has also diverted 366.37 tons by weight from the landfill in 2014. Camp Bestival – This festival in the UK promotes sustainability by handing out different coloured recycling bags to festival goers and when they bring them back – they receive a cup of tea! They also promote sustainable transportation by partnering up with the Big Green Coach and are undertaking an energy revolution trying to target carbon emissions. Coachella Festival – This festival in the USA does things a bit differently. They have contests to showcase your art called ‘Trashed’ if its made of recyclable materials and have a 10 for 1 bottle exchange for great merchandise including VIP tickets. Perhaps the neatest thing of all is their ‘energy playground’ where one can play in the playground to recharge their mobile phone or create energy for other neat things. Cambridge Folk Festival – This festival in the UK is committed to staying environmentally friendly. One way they do this is by strictly recycling and composting as much as possible. With only 2% of all waste from the entire festival last year going to the landfill, the festival has a goal to eventually reach zero waste in the landfill. Some areas, such as the bar and the backstage area, have already successfully created zero landfill waste. Glasses are re-used, packaging is recycled, and cutlery is biodegradable. Even all cooking oil and batteries used will be recycled. Lightning in a Bottle – This festival in the USA uses education to inspire people to make better environmental choices. There are do-it-yourself workshops that teach the festivalgoers new skills, such as how to grow their own food. There are also inspiring speakers who aim to provide festivalgoers with the knowledge and motivation of how to continue to live sustainable lives once they leave the festival in their own daily lives. Lighting in a Bottle also gives away free water, maximizes renewable energy, and works to offset all carbon.